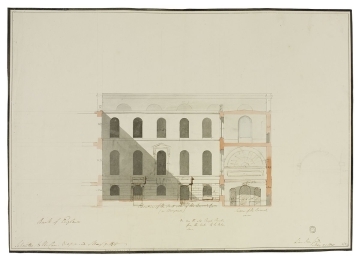 Drawings 1 and 2 were approved by the Building Committee in May 1805. The drawings show the Barracks on the north side of the Great Quadrangle, across from the Accountants Office. To the north, the building faced a gated courtyard on to Lothbury Street. The building is shown on the same level as Lothbury Street, 3 feet above the Great Quadrangle. 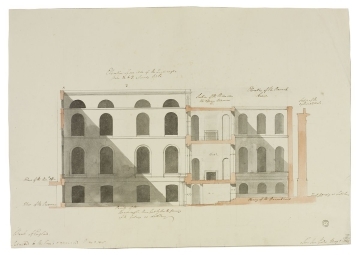 Soane's alterations to the drawings suggest lowering the level of the Court so that two of the Barracks' doors face on to the Court. Other alterations show a bracketed pediment over a window on the first floor and the adjoining building is shown as double-height with a clerestory lunette and three doors on the south wall. The verso of drawing 2 shows the Doric Vestibult as built, omitting the columns at the west (left-hand side) end. 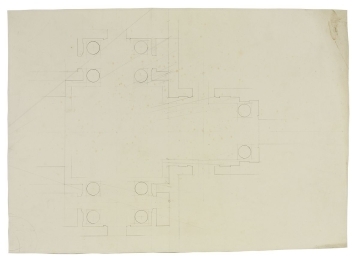 The drawing could be a study for a perspective, with pencil lines extending from a single vantage point.